Josh is talking to a middle aged woman in front of a piano. JOSH: I reckon Brahms and Beethoven must have been like rock stars are today. Josh has forgotten his violin so they have decide to do theory instead however, Melissa is at the door with Josh's violin, Melissa hands it over and runs off as Josh emerges looking a bit shocked! They go to start the lesson and Josh asks to play some Bach, he hovers behind the teacher and it seems he is attracted to her! Melissa is telling Todd about what happened earlier, Melissa wants to know who Katrina is but neither of them has any idea. Todd thinks he might be trying to make Melissa jealous but all off a sudden Todd decides to ring a class mate to find out something. Paul asks what Chrissie thinks of the engagement. CHRISSIE: I'm sure you'll be very happy. Paul doesn't think she approves but she says if he is happy then that's fine. Paul asks if she likes Isabella and Chrissie says that she does not. CHRISSIE: I have my reasons. PAUL: Do you want to tell me what they are? Silence fills the room until Paul goes to hug Isabella. Josh is angry that Todd told Cody but Todd reveals that he knows that Josh's music teacher's first name is Katrina! Josh says that he knows she likes him. Later on, Todd discovers that nothing has happened between Josh and Katrina, Josh thinks she is interested in him but Todd thinks it's a load of rubbish. TODD: You could lose Melissa over this. Todd explains that she does but Josh insists he and Katrina (Miss Riley is her name) can be together. Cody is craving meat but Melissa won't let her, Josh hasn't been in contact yet and Melissa thinks he is angry. Cody has got the wrong end of the stick from Todd and tells Melissa that Josh is seeing Miss Riley. The girls decide that Miss Riley is chasing Josh. MELISSA: There's no way I'm going to stand for this. Des wants to organise a stag night and Paul agrees. 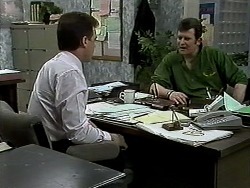 Paul asks what Des thinks of Isabella; Des likes her and suggests that Chrissie is jealous. 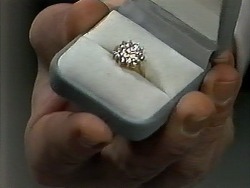 Paul shows Des a very expensive engagement ring which Paul thinks is perfect. Josh arrives wearing a purple silk shirt! As Josh begins to play Miss Riley alters his posture and Josh becomes a bit awkward, he begins to tell her something but the doorbell rings. It's Melissa who calls her pathetic as she is trying to steal Josh, she storms off and Josh looks embarrassed. Paul arrives home early to see Isabella, he gives her the ring. Isabella is very excited and shows Chrissie, Paul then makes Chrissie stay for a drink even though she doesn't want to! Katrina explains that she has a fiancé; Josh is all a bit embarrassed and begins to play some Bach! Paul asks Isabella why Chrissie doesn't like her, Isabella says there has been no fight but Chrissie is very unhappy. Paul tells her how special she is and they smooch. Cody catches Melissa eating a hamburger, she stops her. CODY (staring at the burger): Who? Josh then appears had is annoyed that Melissa went to Miss Riley's house earlier, he was embarrassed. MELISSA: Looks like it wasn't just her fault! You're a two-timing, gutless, stupid, moronic scumbag! Melissa storms out so Cody throws the hamburger at Josh and follows Melissa. ISABELLA: What are you doing? How dare you touch my handbag! CHRISSIE: I was trying to find a tissue. CHRISSIE: OK, I was trying to find something to prove that you're not the poor little peasant girl you make out to be. ISABELLA: You don't believe I am poor? CHRISSIE: Oh yeh, I believe that all right, it's the little brother I don't believe. 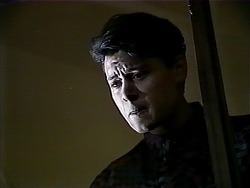 Just then Paul walks in and Isabella rushes over to Paul in tears, she tells him that Chrissie has been horrible to her.